The Rif Development Foundation (SOR) has decided to appoint someone who is dedicated to SOR in a special way as “volunteer of the year”. For the year 2017 this title went to our sister Najat Benseddik. Najat has been involved in SOR since the foundation and has been the coördinator of the fundraising event fus dg fus, organized by SOR on 23 December 2017 in Utrecht. 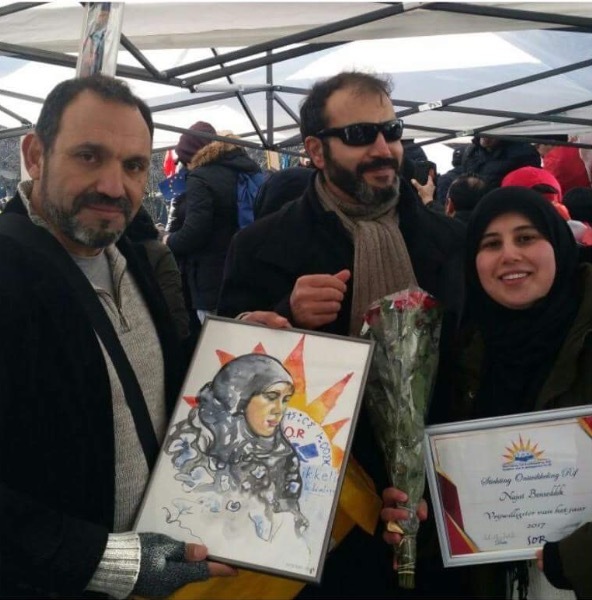 During the demonstration of 28 February 2018 in Brussels, SOR surprised our sister Najat with this acknowledgement. Thank you Najat for your efforts and help within our foundation. We hope you are happy with this title and the portrait SOR has made for you. N.B. The portrait was made and donated by Maartje Jaquet.